KwaZulu-Natal is a magnificent South African province that offers a particularly multifaceted experience for visitors from all over the world. It has busy metropolises, exciting cultural and historical attractions, adventure sports, beautiful landscapes and irresistible beaches. Its capital city is Durban, which boasts the King Shaka International Airport, and a plethora of malls, museums, galleries, restaurants, and other attractions. KwaZulu Natal is also where the gorgeous Amatigulu Nature Reserve is found. This is a wonderfully peaceful, picturesque retreat that is nestled between two rivers mouths – the Tugela and the Amatikulu. This idyllic placement puts Amatigulu in the prime position for a huge array of animals, plants, sights, and sounds. This nature reserve offers a very special experience, and stands out for its having animals grazing on forested sand dunes right on the coast, which is a particularly rare and exciting sight. The coastal vegetation is dense and beautiful, providing plenty of food for the animals and an exquisite natural habitat. The wildlife found here includes waterbuck, giraffe, zebra, and other small antelope species. Of course, the lush greenery and stunning diversity make Amatigulu Nature Reserve the ideal home for a variety of bird species. So, avian enthusiasts are encouraged to bring their binoculars and identification books, and to keep an eye out for some of these birds. The rarely spotted African Finfoot is just one of the species that make for exciting bird watching. Game drives are available at this reserve, inviting visitors to head into the countryside and experience the rich beauty of KwaZulu-Natal from their 4 x 4 vehicle. 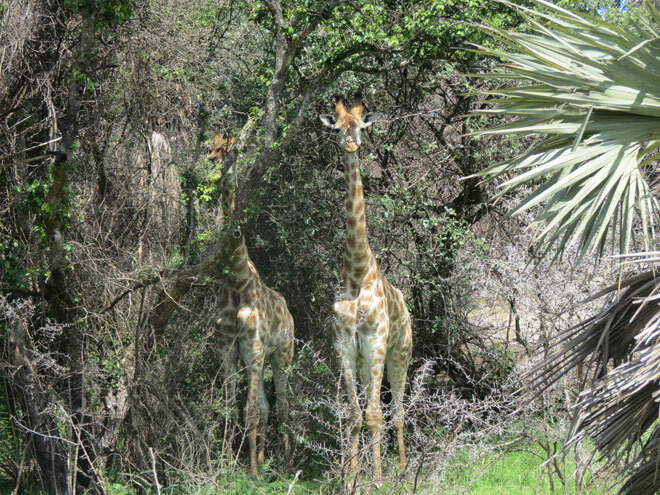 A number of game drive trails means variety and abundance. There are also self-guided walking trails. These are fantastic for families that want to have a hands-on, intimate approach to their South African experience. The Nyoni River is found within the reserve too, and is popular for paddling. The Amatigulu Estuary is a great spot for boating, canoeing, and fishing. Those wanting to escape to the serenity of the river banks will be well rewarded at Amatigulu, especially in the warm conditions for which KwaZulu-Natal is well known. The coastline is frequented by whales during the second half of each year. These powerful marine mammals skirt the shores as they migrate for feeding and breeding purposes. There is a whale watching tower on the sand dunes, from where the delightful antics and mammoth scale of these animals can be appreciated. 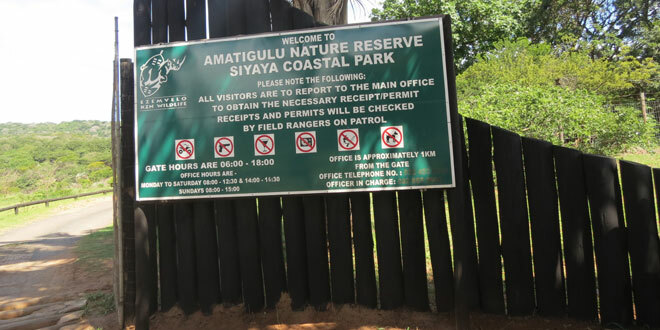 The Amatigulu Nature Reserve is a 90-minute drive from Durban and is, therefore, central and accessible to locals and international visitors.